Just reach out for this high quality, all natural, unique tasting product that takes you right back on a nostalgic trip home. Kulfipop Malai: All natural Kulfi, with the great back home taste. Enhanced with rose water, cardamom, almonds and pistachio. 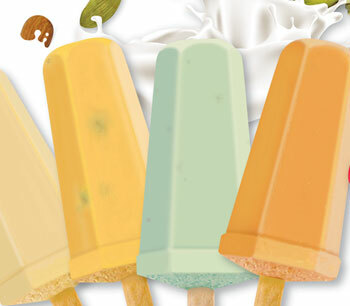 Kulfipop Mango: All natural Kulfi made with highest quality Indian mango pulp. Kulfipop Kesar Pista: All natural Kulfi made using the purest Spanish saffron, this dessert is a pure delight for saffron lovers. Kulfipop Pistachio: All natural pistachio Kulfi, delicate and not too sweet.